In November 2017, I had the honor of speaking at DevFest Florida, a community organized developer conference focusing on Google technology. I had an amazing time at this conference. 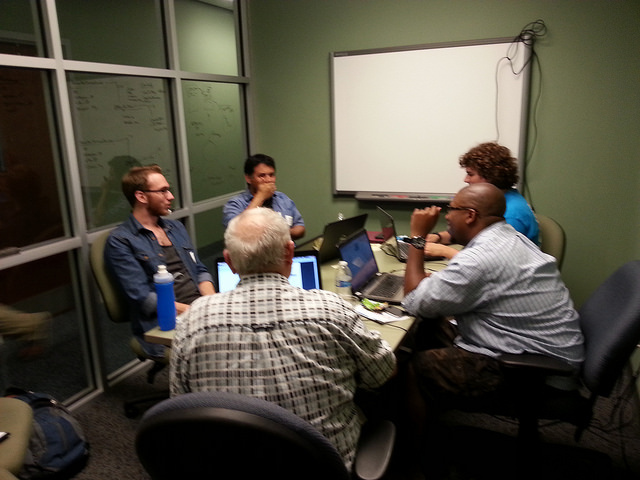 You can check out my reflections on this experience at GDGCentralFlorida.org. Readers of InspiredToEducate.NET know that we’re passionate about helping students to love learning through making, tinkering, and engineering. For me, I encountered a talk that impacted me regarding the intersection of community service and maker education. I do believe in Daniel Pink‘s argument that we’re very motivated or driven in situations where we have autonomy, are growing in mastery, and acting with purpose. The projects that I’ll discuss in this post connect strongly to mastery and purpose motivations. This talk encouraged me to reflect on why I enjoy helping people to learn to code and the culture of a maker space. Etienne Caron-Petit-Pas shared an amazing story of using mixed reality and maker technologies to create a positive social impact in this community. In OSMOS academy that he helps organize, I appreciated that their community focuses on building stuff that can help enrich people’s lives. It’s not just about the maker tech. For example, their current project focused on building playful VR experiences to support and distract kids who are going through medical procedures in a hospital. Some of the other projects they have attempted feel like citizen science efforts. This talk touches technology ranging from Google Daydream, augmented reality, Android Things and more. In general, we’ve explored the idea that maker education connects students to the experience of project based learning. Under this paradigm, students engage in learning through the construction of projects or physical stuff. Learning is not centered around a teacher as the center of knowledge. Maker education learning experience always ask students to personalize the learning experience by asking the student: what do you want to make? All other lessons connect into project direction set by the student. Along a similar theme, I recently encountered a cool podcast interviewing the founder of FreeCodeCamp.com, Quincy Larson. Quincy Larson worked in a traditional k-12 school working as a teacher. Along the way, he became interested in giving his fellow teachers more time by automating administrative computer tasks and creating systems for automatic grading. Through this experience, he became interested in learning to program professionally. After connecting with local makerspaces/hackathons, local meetups, and doing thousand of hours of study of MOOCs, he returned to his “teacher hat” and realized that many others might want to go on this journey too. He helped organize FreeCodeCamp.com to help other “campers” leverage resources and coaching he had gained. I’m very impressed with the scale of curriculum, community and effort to create local meetups in cities near you. While it’s easy to find YouTube videos or Mooc content to learn stuff, their teaching team acknowledges that learning as a local tribe in your local coffee shop or makerspace really helps to drive the learning forward. It’s very easy to get demotivated when you don’t have mentors or fellow students to go on the journey with you. I do want to give a shout out to “The Change Log” podcast that shared this conversation. I haven’t been listening to them long, but I enjoy their content. FreeCodeCamp.com connects with the idea of community service learning by engaging real non-profits with real IT needs with their students. It’s a really neat “win-win” situation. The non-profit gets a cost effective solution. The students have a great learning experience addressing a local need while growing their web development skills. On a personal level, I have enjoyed seeing students(young and old) become engaged with their path of learning through hackathons, makerspaces, and developer community. Why does community service learning matter? This feels like a unique flavor of project based learning since grass root connected learners work together to learn while making a difference in their community. The world needs more of this kind of innovation in education and community service.